A recent report incorrectly claimed that UV nail lamps are a source of "high-dose UV-A" and also inaccurately compared UV tanning beds with UV nail lamps. The report, Occurrence of Nonmelanoma Skin Cancers on the Hands After UV Nail Light Exposure" (MacFarlane and Alonso) 1 , overestimated the exposure of client skin to UV light emitted from UV nail lamps and improperly characterized the effect of these lamps on the hand. Lighting Science, Inc. of Phoenix, AZ., is a fully equipped, completely independent scientific testing laboratory that specializes in the development and testing of many types of illumination devices, including those that emit UV light and Lighting Science is not in the business of manufacturing or selling UV nail lamps. The two selected UV nail lamps were submitted to Lighting Science in brand-new condition. 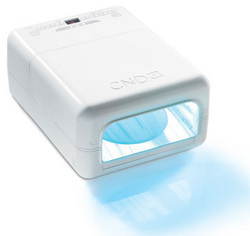 Highly sensitive UV detectors were placed where client hands would normally reside while inside a UV nail lamp. These detectors accurately measured the amount of UV-A and UV-B light emitted from each UV nail lamp. To ensure a proper comparison, Lighting Science also used the same test equipment to measure the UV-A and UV-B light found in natural sunlight. A discussion of these measurements and results is presented below. minutes. In this report, we will always assume the highest level of exposure: 10 minutes per hand, twice per month. Oddly, the authors described this patient as a 48-year-old white woman who claimed to have "moderate recreational UV exposure". We fail to understand how, under the circumstances, it could be concluded that this case of nonmelanoma skin cancer is caused by these eight exposures to a UV nail lamp, especially in light of the low levels of UV exposure expected during these few visits to a salon. We respectfully disagree and believe the results of Light Science’s independent testing are in agreement with our own laboratory findings supporting the safety of UV nail lamps. • McFarlane and Alonso's report has a faulty conclusion because it is based on incorrect assumptions. • If a client insists on wearing sunscreen, they should still be asked to wash their hands before any salon service begins. In this case, the Nail Technician should take special care to ensure nail plates are properly cleansed and dehydrated in order to prevent service breakdown (e.g. product lifting, discoloration or mottling) from the film sunscreen products can leave behind. Also, it is crucial to keep sunscreen lotions and sprays away from implements and supplies used during the nail service to avoid contamination. Doug Schoon, M.S. Chemistry, UC Irvine, is an internationally known scientist and lecturer with 20 years experience as a scientific researcher in the professional nail industry and has many years experience developing UV cure nail products. Schoon is author of Nail Structure and Product Chemistry, 1st & 2nd editions, many dozens of trade magazine articles and chapters in the textbook Milady's Standard Nail Technology, as well as chapters on cosmetics in a variety of different reference books for Dermatologists. of Light Elegance Nail Products. A formulating chemist of UV cured systems for 12 years in the beauty industry. Jim is a contributing author for Milady’s Standard Nail Technology as well as articles in many manicuring trade magazines.